Annapurna Machhapuchhre Treki a fabulous journey in the Annapurna region. It avoids the main route via Ghorepani, rather the trek uses a different and peaceful trail. It goes via Dhampus, Forest camp, Humal, Guhe and finally to the Machhapuchhre base camp. Machhpuchhre Trek begins from Phedi and trek to the Dhampus village. The large Gurung village is located at the shadow of Himchuli and other peaks. Exploring the stunning panoramas of Himalayas and green hills, you save a lifetime memory of the adorable youth of the nature. Even the Gurung culture and hospitality offer an awesome experience of the trip. Walking through the rhododendron forest is remarkable. The isolated trail and chirping melodies of different species of birds is the dynamic feature of the trek. Finally, it reaches to the Machhapuchhre base camp (Fishtail peak base camp). From here, the spectacular virgin peak- Mt. Fishtail can be explored from the closer distance. 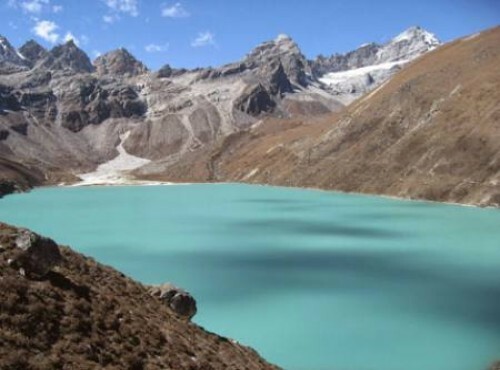 Then the trek retraces through Seding, Thulo Chaur and Ghachok from where you take a drive to Pokhara.For the unique and peaceful journey in Annapurna region, Annapurna Machhapuchhre Trek is one of the best options. For all the requirements, feel free to contact Adventure Club Trek and make your journey extremely memorable. Upon your arrival at Kathmandu International Airport, you will be welcomed by a representative from Adventure Club Trek. After sorting out your custom formalities (Visa etc) you will be then transferred to your respective hotel in our private vehicle and give you some time to freshen up. After this, we will attend an orientation about your trek led by our Trekking leader over a welcome dinner. MealThe exciting day begins with a cultural tour to various mediaeval sites in Kathmandu. We drive to visit the UNESCO listed world heritage sites- Pashupatinath temple (the biggest Hindu shrine), Boudhanath (largest Buddhist Stupa in Nepal), Swayambhunath (A fine Buddhist Stupa at the hill top of Kathmandu) and the Kathmandu Durbar Square (an open museum and abode of Kumari). Coming back from the sightseeing, take part in a short briefing and trip preparation. Overnight at hotel. After breakfast, We will drive to Pokhara from Kathmandu. The road is winding and the lush vegetation attracts us along with the Himalayan views. It takes approximately 6/7 hours to reach there. It is a city of Lakes and natural wonders. You can enjoy the boating on Phewa Lake, the same day.Overnight at hotel. After break fast drive to Phedi via Tibetan camp and steep climb up to Dhampus village one of the big Gurung village. Spectacular panoramic views of Annapurnas. Overnight at Teahouse. Today we will start our secret trail leaving tourists, other trekker and even villagers behind. Trek enter an enchanted forest of birch, giant rhododendron, mountain oak, maple, hemlock and daphnia, camping in a small clearing far from the beaten trail. Overnight at Teahouse. As we climb, the flora has turned to classic cloud forest with mosses and lichen, tree ferns and orchids hosted by the hardier trees. There are natural windows in the woods that look out on to thrilling panoramas towards Hiunchuli and the knife-sharp traverse towards Annapurna South. Far below, to left, can see the Modi Khola valley leading up into the Annapurna sanctuary. Though still surrounded by forest, have spectacular northerly views of the ever-closer Fishtail. Overnight at Teahouse. After a relaxed breakfast, tired bodies make an unhurried descent through the shade of the forest, and out onto terraced fields, down 1600m in all. This is a different route down-down to the upper Mardi Khola, the torrent that has been the ice and snow of the Mardi Himal. Although remote and still away from the much-used ‘Tea – house’ trekking routes, our expedition now takes on the moods of the warm valley and the friendly villages. Here, we make our way along the banks of the Mardi Khola from the hill – side village or siding, down through the lovely fields, past the simple farms and over the interesting bridges. There is no doubting this is indeed the idyllic Nepali countryside. Overnight at Teahouse. Driving back to Kathmandu for about 6 hours, your day is free, however, at even tide; you will be taken to the Nepali kitchen for a delicious farewell dinner of the original Nepalese cuisine. As you enjoy your meal, you will also be entertained to an exciting cultural dance performed by the locals. You will enjoy this experience which is complimentary on behalf of the ADVENTURE CLUB. Overnight at Hotel. Accommodation in a two star hotel in Pokhara on a bed- and- breakfast basis (2 nights). All ground transportation on a comfortable vehicle as per the itinerary. All your standard Meals during the trek (breakfasts, lunches, dinners) with tea /coffee. Welcome and farewell dinner in Kathmandu as listed in itinerary. Fully- licensed, English-speaking Trek guide /Leader trained in Wilderness First Aid. Porters to carry your luggage during the trek (2 trekkers:1 porter). Staff costs including their Salary, food, accommodation, transportation and medicine. Assistant trekking guide (4 trekkers: 1 assistant guide). Travel & Rescue arrangement (Helicopter Evacuation available if required, at clients’ cost). Adventure Club Trek bag/duffel bag, Medical kid bag, T-shirt and trekking map (yours to take). Any meals in Kathmandu and Pokhara other than breakfast. International air fares/ flights (Fares and flights can be arranged upon the request). Tips for guide, porters, driver (Tipping is expected, but it is not mandatory.. Prior to all our treks and expeditions, we host a Pre-Trip meeting in Kathmandu. The primary purpose of meeting is to provide an opportunity for individuals to ask questions about the forthcoming trek and to introduce them to other team members. The meeting covers topics as diverse as personal equipment and acclimatization and usually involves a hike and some skills training. We believe that pre-trip meeting is very important in order to better preparation of the trekking. Accomodation Standard hotels with breakfast in Kathmandu and Pokhara, teahouses during the trek. Permits: TIMS PERMIT, ACAP, ANNAPURNA CONSERVATION PARK PERMITS.